At this year's Scotch Pie Awards held at Dunfermline's Carnegie Hall on 15th January 2014 Pars Foods Ltd walked away with a record breaking 8 awards. 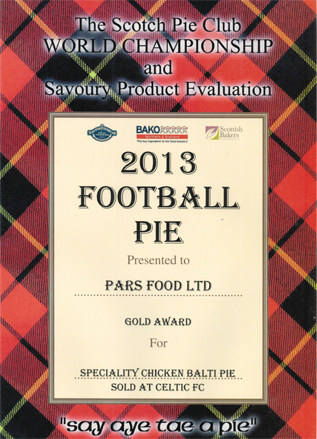 We are happy to announce that Pars Foods have been awarded 2 Gold Awards in the Scottish Pie Competition 2013. The Gold Awards were for pies sold at St. Mirren F.C. 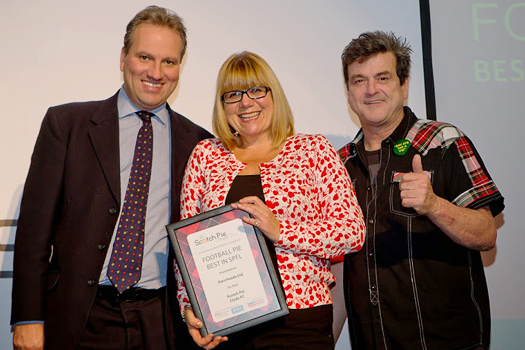 and Celtic F.C. 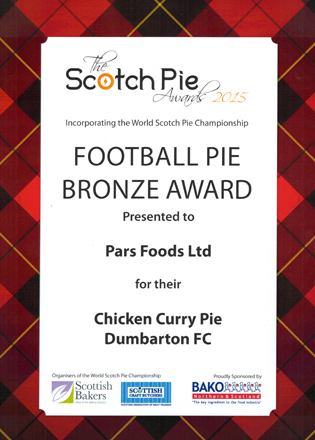 We are happy to announce that Pars Foods have been awarded 2 medals in the Scotch Pie Club Championships. 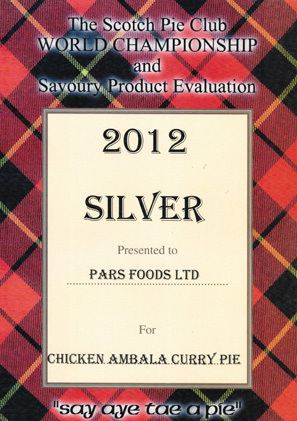 A silver medal for our Chicken Ambala Curry Pie and a bronze for our Sausage Roll. 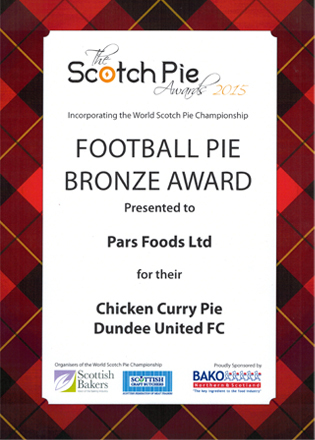 We are happy to announce that Pars Foods have been awarded 3 medals in the Scotch Pie Club Championships. 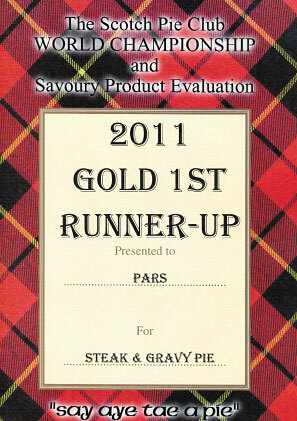 A gold medal for our Steak & Gravy Pie, Silver for our Chicken Balti Pie, and a bronze medal for our Bridies. 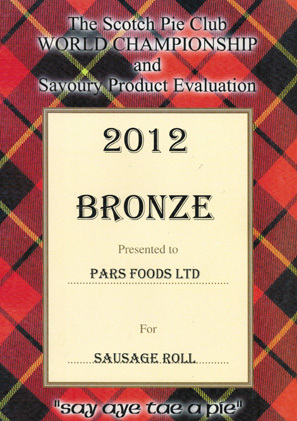 Pars Takes Sausage Roll Bronze! 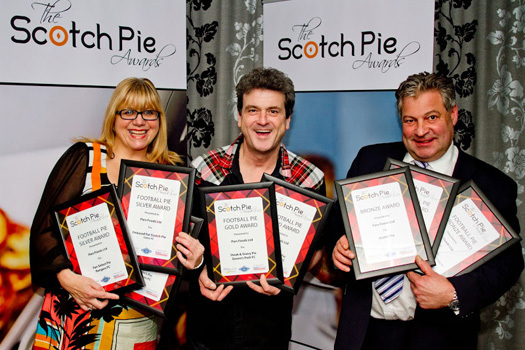 We have been lucky enough to have our great sausage rolls awarded the 3rd place prize in the Scotch Pie Club's World Championship and Savoury Product Evaluation! This is a great achievement for us and shows that our products are up there with the best in the world. 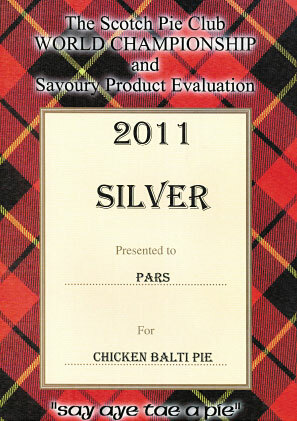 Par's New Healthy Mince Pie! 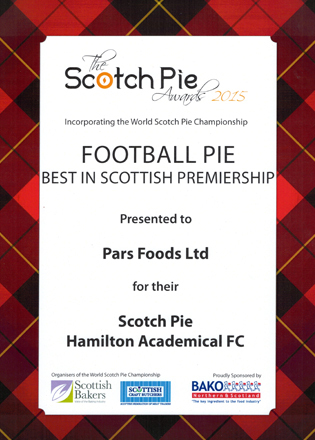 The familier scotch pie has been given a makeover! 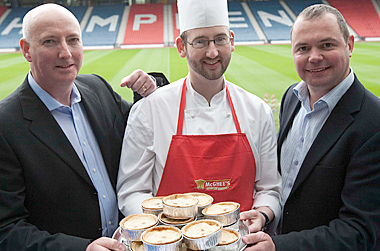 Pars Foods have worked together with McGhee's Bakery to create a brand new low fat version of he traditional Scotch Pie, with 50% less saturated fat and 30% less salt. The new healthier, “Wi'oot The Greeze” alternative has all the same great flavour and is available now at Hampden Park Football Ground. 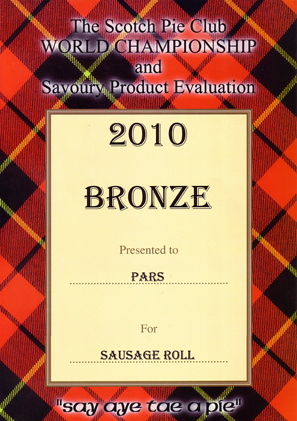 PARS Foods have been baking since 1952 and over the years we have picked up several industry awards for our innovation, taste and continued efforts to supply the client with a superb product all the time.